"Orthodontics and Dentofacial Orthopedics" is one of the nine specialties. Essentially, while orthodontics entails the management of tooth movement, dentofacial orthopedics involves the guidance of facial growth and development, which occurs largely during childhood. Appliances are frequently used — the more familiar braces for orthodontics, and other specialized appliances like headgear and expanders depending on what facial abnormalities are present. Dentofacial orthopedics is the process of normalizing the growth of a patient’s bone structure and repairing any imbalances of the face and jaws. This process often involves a two-phase treatment and may begin when the patient is around 7 or 8 years old. Children are often the best candidates for receiving dentofacial orthopedic therapy. Beginning at a young age, Dr. Sordelli will examine and monitor your child’s growth to determine when treatment will be most effective. 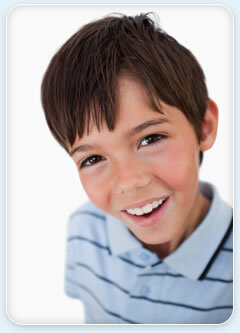 If your child begins orthodontic treatment before all adult teeth have erupted, it is known as phase-one treatment. During phase-one treatment, Dr. Sordelli will use treatments designed to correct your child’s jaw growth and make sure that the jaw bone is properly aligned before beginning the second phase of treatment, which usually involves braces to straighten the teeth.In children, the jaw bones are still forming and have not completely hardened, making it easier for orthodontists to control bone growth and tooth movement. Sometimes orthopedic treatment may precede conventional braces, and often the two are accomplished at the same time. So if your child gets braces and headgear, he's actually undergoing orthodontics and dentofacial orthopedics. See our before and after gallery for examples of orthopedic treatment. Being skilled in both areas, Dr. Aurora Sordelli is able to diagnose any misalignments in the teeth and jaw as well as the facial structure, and can devise a treatment plan that integrates both orthodontic and dentofacial orthopedic treatments.